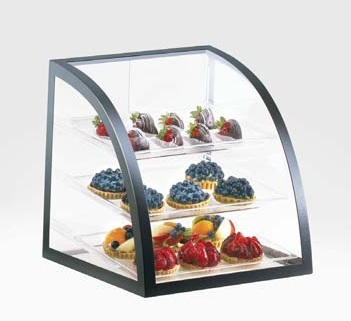 The Black Iron Bakery Display Case with 3 Shelves is sleek and stylish. Your customers will be lining up to purchase your baked treasures. With 3 trays you can give patrons a variety of delicious treats. This countertop display is ideal for highlighting those pastries, cookies, and other scrumptious treasures you have to offer. The black iron from add a touch of class to any counter. Add to your displays in your bakery, retail store or anywhere you want to offer patrons a quick treat. The rear door on this bakery case allows easy access for refills, to let you keep your customers supplied with all of their favorites. Add to your cart today at All Candy Containers. WARNING: This product can expose you to chemicals including Ethyl acrylate, which is known to the State of California to cause cancer. For more information go to www.P65Warnings.ca.gov.